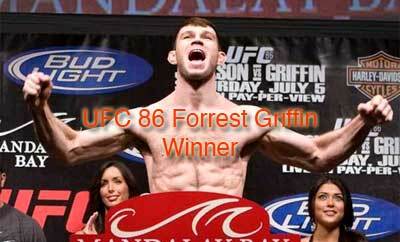 UFC 86 JACKSON Vs GRIFFIN has Forrest Griffin winner by unanimous decision. July 5 in Las Vegas, Nevada at the sold out Mandalay Bay Events Center, the 205 lb Ultimate Fighting Championship fighter went against the Vegas odds and pounded out an exciting five round decision over Quinton Jackson to take the UFC light heavyweight crown. Immediately after the fight, Griffin wants another match with Rampage. He was the first winner of The Ultimate Fighter reality SPIKE TV show and only the second to win a world UFC title. Jackson said that Griffin deserved the win in the Octagon in Vegas. The mma fight was scored 48-46 x2 and 49-46 for Griffin. On Jackson’s way to the fight he stopped for a few moments to talk with TV celebrity Wilmer Valderamma of “That 70’s Show“. Griffin came out kicking in the first round to the legs and head. His hands were very quick to his opponent. Jackson was at his best when close and connected with better accuracy. In a little more than two minutes into the fight he connected with a jarring left hook. Recovery was fast, but Griffin was dropped by a right uppercut. Moments before the bell rang Griffin engaged Rampage. The second round started with a left leg blow that visibly hurt Jackson. Griffin moved closer for a guillotine. The round moved more to the mat and grounding and pounding and submissions against Jackson to the round’s finish. Jackson was showing his cards with an iced left knee before the round started. As the third round started Jackson kept his distance to avoid additional leg kicks. Two minutes remaining Jackson forced hard counters to the head and body shots. The excitement grew as the round was ending and Griffin came on strong. The final two rounds remaining Jackson landed heavy shots and hurt the challenger. Griffin was strong and landed a takedown at 1:20. He locked in a triangle choke with his face bleeding. Jackson wasn’t going to have it and broke the hold and continued the ground and pound. Griffin was physically shaken with head shots. His comeback, more leg kicks. Opening of the final UFC 86 round was greeted with precision leg kicks. Jackson received plenty to the head. Jackson had to get his game back in the final round and landed body and head shots. The shots only made Griffin stronger and passed them right back. The remaining minute brought the excited fight fans to their feet. Adrenaline was pumping, blood flowing and hits didn’t stop until the bell finished the round. Many think Rampage should have won, others agree this was one of the best fights of 2008. The news of the resulting winner improves Forrest Griffin to 16-4; Quinton Jackson falls to 28-7. Call 702-505-6988 for VIP residential real estate mls search with a real estate agent. UFC 86 JACKSON vs GRIFFIN has Griffin winner by unanimous decision.